Shahpura Bagh is 40 acres of nature, a stunning pool and two restored bungalows. This estate has been granted to the owners’ ancestors by Mughal emperor Shah Jahan in 1630 AD for successful military campaigns against the Marathas and Afghans. Luxury and heritage, this estate has got the best of both. 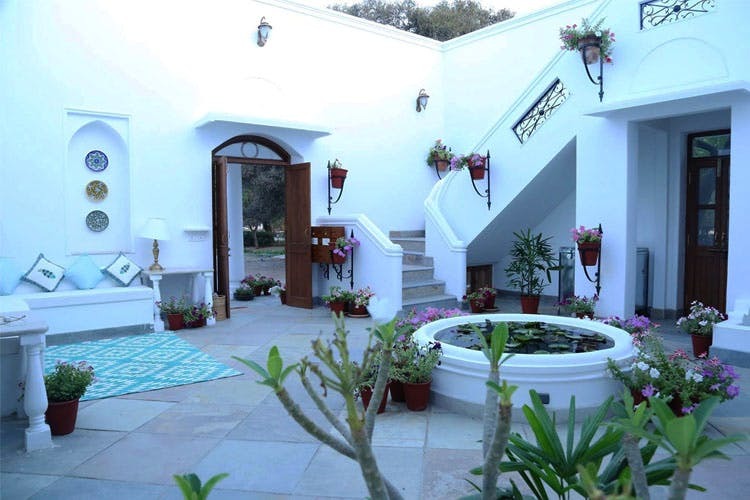 Also, the residence of the rulers of Shahpur, the Shahpura Bagh is an intimate boutique homestay offering nine suites that exude an air of understated luxury. The five royal suites and four suites in this hotel are spread between two residences – Nahar Niwas and Umed Niwas. Nahar Niwas is also the family residence, which also has the private dining, lounge and bar. The air-conditioned suites are massive spaces, furnished elegantly in warm tones of green, rust and brown. The en-suite bathrooms are delightfully large with modern fixtures and luxury amenities. However, it’s Shahpura Bagh’s swimming pool we’re most impressed by. The estate around has many spaces for alfresco dining, while dinners are often in front of Nahar Niwas. Cuisine is signature, recreated from menus passed down over generations, which they can also showcase on request. Overall, the Shahpura Bagh experience is that of a boutique mansion stay, luxurious and stylish with opportunities to explore around. Farm visits, interactions with phad artists, sunsets at Dhikola fort and tribal village safaris are some other things to do around town. Lounge by the pool, explore the lakes nearby, bird-watch and just have a chill time. Plan a trip soon, then? Book here.